Keder. What is it, exactly? It’s the present and future of tents, that’s what. Technically speaking, keder is a bead that’s attached to the edge of a fabric panel that allows the fabric to engage in a corresponding “track” in a frame. It is seen in a litany of applications, but the one we are most concerned with is tents – and it has taken over our world. 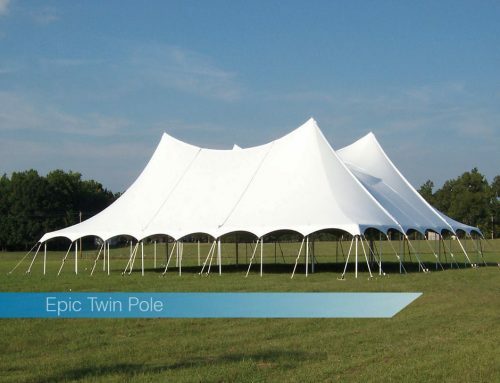 It’s seen in everything from small 10’ wide marquee frames through the largest metric structures in the world. It enjoys making our lives better through tighter roof panels as well as sidewall systems that are superior in every way. This technology has found its way into our tents by being simply better than older technology. What am I talking about, you ask? The Old Way: The old way of joining fabric panels included a variety of methods from lacing adjacent sections with corresponding loops and grommets to mechanical fasteners such as metal clips or plastic side release buckles. In any of those methods, the installer had to decide to either join those pieces in whole on the ground or to join them once the fabric was on top of the frame – but in either case, the tops had to be joined together mechanically. This joining of top panels is labor-intensive and cumbersome. It involves unnecessary time on a ladder, adding to safety concerns. The dragging of the tops over the frames in whole or in unmanageable parts creates premature wear that shortens top life and makes installers’ lives difficult. They are tough to manage in inclement weather like rain or wind and limit the ability to work over and around obstacles commonly found on tent sites like trees, fences, and light posts, and walls. The New Way: Enter keder. This system gives the owner a product that under the same conditions will last infinitely longer than a conventional top. It also provides the installer with a wide variety of installation options that help install a tent over and around just about anything imaginable, often times without even getting on a ladder at all. The top panels provide attachment points whereby pull ropes are attached. These ropes stretch up and over the frame and are pulled from the opposite side of the roof framework, sliding the keder through the corresponding tracks in the frame rafters. The tops are under control by the installer the entire time of the installation and slide freely up and over the frame, then are attached by a variety of fastening system along the perimeter. The keder’s engagement in the framework seals out the elements, making for a supremely tight fit. Tops are easily tensioned, which makes for a tent that’s much more likely to resist the elements and shed water like it should. Then there are the sidewalls. Sidewalls can be built with keder on up to 3 sides, which will allow for walls that are engaged in the legs, just like the tops are engaged in the rafters. Those walls are suspended by a variety of keder devices along the top that allow the walls to be easily opened and closed at the user’s desire. There is no doubt that keder is here to stay and will continue to make all of our tent lives better.